As you may know, us Brandefyers are product geeks. We got the team together for a Friday night dinner and lotion testing session on one of the coldest nights of the year. We came with our dry, winter skin, and sensors ready to find some great lotion dupes. 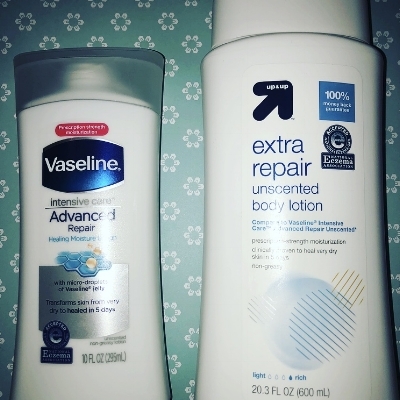 Brandefy compares store brands (i.e., up & up) to name brands (i.e., Vaseline) to reveal when the generic is as good as the name brand, and to warn you when it is not. Our goal is to help you save time and money, and to have a good time while doing it. Let's start with some of our favorite dupes we found. 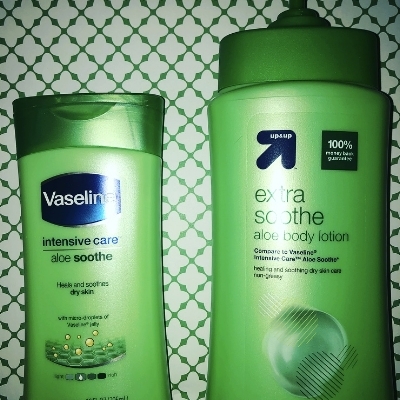 We picked up two different types of Vaseline brand lotions as well as the up & up version of each. Both the Intensive Care Aloe Soothe and Intensive Care Repair lotions have a great store brand counterpart. We gave both up & up versions a similarity score of 88%. The ingredient panels are nearly identical on these two. These lotions have an 88% similarity score. Next up was Suave Advanced Therapy vs. up & up Advanced Therapy Body Lotion. Both lotions had a similar, neutral smell. They were similar in color, packaging, and after-feel. We did find the up & up version to be slightly thicker and easier to rub in. With similar ingredient panels, we gave the target version a 90% similarity score. This was another great dupe with a 90% similarity score. We found some lotions we did not like as much as the name brand. You will want to steer clear of the next two lotions. We gave the Target version of Jergens Original Scent Long Lasting Lotion a 75% similarity score. While ingredient panels were similar, all testers agreed that the up & up version had an intense after-tingle. It was not a pleasant, light one, but was rather alarming on our skin. Additionally, testers preferred the scent of the Jergens lotion. Don't shock your skin with the store brand- it's too tingly! The final lotion was a big smell no-no for us! 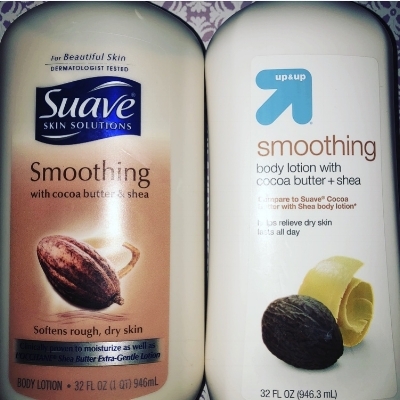 We tested Suave Smoothing lotion with Cocoa Butter and Shea against the up & up lotion. All testers did not even want to put on the up & up version, with one Brandefyer commenting that it smelled like an old lady who hadn't showered (no offense to older women who need to bathe). Ingredient panels were only 70% similar, and the colors were very different as well. We gave this one a 55% similarity score. As always, we hope this keeps you informed so you can make the best purchases. Our skin is feeling a little smoother now!